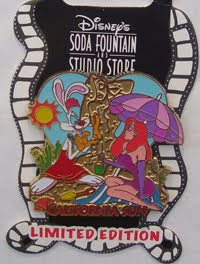 A surprise pin was released at Disney's Soda Fountain and Studio Store in California on 08/07/2010. Roger and Jessica have some fun on the beach - and Roger makes a sand sculpture of Jessica! The Pin is a Limited Edition of 300.